Eurosport commentator David Harmon has said that he is convinced that Irish road race champion Matt Brammeier will make a strong impression next season, rewarding the HTC Columbia team's decision to sign the 25 year old. 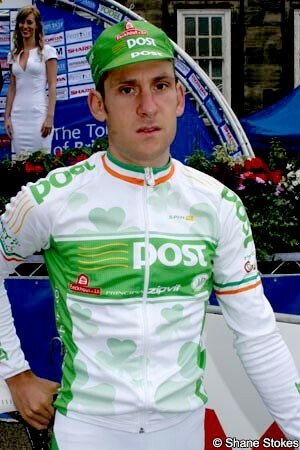 The Liverpool-born rider, who declared for Ireland in 2009, was named by the team yesterday as being its latest signing. Harmon has been acting as his agent and believes this is an important opportunity. Brammeier showed his ability back in 2005 when, as a 19 year old rider, he finished fifth overall in the 2.2 Flèche du Sud. It’s taken him a while to come back to full fitness after his accident, but he’s clocked up several good performances this year. In June he beat Nicolas Roche (Ag2r la Mondiale), Dan Martin (Garmin Transitions) and others to win the national championships; in July he was third in the 1.2 GP Stad Geel, then in August he was sixth on a stage and eighth overall in the Mi-Aout Bretonne. His performance on the final stage criterium at the Tour of Britain earned attention, when he broke away immediately after the drop of the flag, stayed clear for half an hour, was hauled back yet still had the legs to attack again in the closing stages. He received the most aggressive rider award as a result. In Sunday’s Elite road race at the world championships, he was once again the first to attack and his horsepower helped the small break to stay clear for 200 kilometres. Brammeier’s role on the team hasn’t been defined as yet, but it’s very likely he’ll be required to support Cavendish when the two of them are in the same races. He’s got the ability to ride on the front for a long time and could become part of his leadout train. Alternatively, his place on the team could take another direction; because of his injury and the resulting time away from the bike, it’s too soon to be certain where he will fare best. Harmon is sure that he will do well, however. “It's taken a while [to get to the ProTour level] but you can see just how excited Matt is after he instigated the break at the worlds.